Recently, my husband and I made a trip to the Holocaust Museum in Houston, TX. After a trip to the national museum in Washington, D.C. twelve years ago, I thought I was prepared to have my senses and my heart assaulted anew by the atrocities on display. I wouldn't be caught by surprise again; I knew what to expect. But I didn't count on this: you never get over seeing Evil personified. And I think what made this experience more poignant, was that this museum was even more personal. This exhibit was filled with private and intimate articles from Holocaust survivors living in Houston, along with items from family members who had perished in the death camps. There were photos and letters and family trees of Houston residents. And when you saw how many of the branches of those family trees were cut off ... the thousands of children who would not live to add branches of their own ... this experience became even more personal. I wasn't sure my heart or my mind could take anymore of the diabolical and unholy stories of persecution. My soul gasped for a breath of hope and promise. And then I came across a small display with the photo of an attractive young woman, smiling into the camera; and I found something to lift my spirits. Her name was Hannah Szenes (Senesh) and she was born into a non-religious Jewish family in Budapest, Hungary in 1921. Although she was born into a wealthy, assimilated family, Hannah began to experience anti-semitism in her high school years. This led her to rediscover her Jewish roots, and she became very interested in the Zionist movement (believing that the Jewish people are connected to the ancient land of Israel). After learning Hebrew, she emigrated to Palestine in 1939, where she studied agriculture for two years and then joined a kibbutz in Caesarea. Her brother, Giora, would soon join her. In 1943, Hannah was approached to become part of a clandestine military project whose ultimate purpose was to offer aid to beleaguered European Jewry. She studied how to become, first, a wireless operator, and then a paratrooper. She volunteered to parachute into Nazi-occupied Europe to aid Jews under Nazi oppression and underwent further training in Egypt. Altogether, there were 250 men and women who volunteered to parachute. Of the 110 resistance fighters who underwent training, only thirty-two were actually dropped, and five infiltrated into target countries. In March of 1944, about one week before the German occupation of Hungary, Szenes dropped into Yugoslavia, together with fellow parachutists from Palestine. There, Hannah spent three months with Tito's partisans, hoping that with their help she would be able to get into Hungary. But the German invasion of Hungary in March 1944 postponed their plans, and Szenes crossed the border to her former motherland only in June of that year. Captured within hours of having stepped on to Hungarian soil, she was sent to prison in Budapest where she was tortured by Hungarian authorities in the hope of receiving information regarding Allied wireless codes. 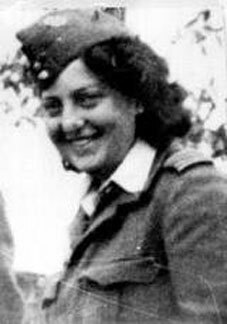 Within days of entering Hungary, her two co-parachutists were also captured, unaware of Szenes’ whereabouts. When the Hungarian authorities realized that Hanna could not be broken, they arrested her mother, and Katherine Szenes saw her daughter for the first time in 5 years. She had no idea that her daughter had left Palestine, let alone was involved in the Resistance movement. Even though the sight of her child's bruised eyes and missing teeth were a shock, both women refused to cooperate and Katherine soon found herself in a cell near her daughter. Katherine was released nearly 6 months later and sought legal assistance for her daughter, who was brought before a wartime tribunal. Hannah, who was a Hungarian national, was to be tried as a spy. She pleaded her own case, and gave a passionate speech before the judge, warning them that the war was coming to an end, and it was they who would soon be charged with treason. Her speech was taken as a personal affront by the officer in charge, and Hannah was given the death sentence. She had one last chance to save herself: she could beg for a pardon, or face a firing squad. Hannah would not back down from her mission, nor beg for clemency, and on the morning of November 7, 1944 she was executed in a snow-covered Budapest courtyard, refusing a blindfold in order to face her murderers in the moments before her death. Hannah was 23 years old. Her body was then buried by unknown persons in the Jewish graveyard at Budapest. Her mother's agony was not over. She escaped from the horrors of the Budapest "Death March", in which 70,000 Jews were forced to march on foot to camps such as Dachau in southern Germany. After escaping, Katherine hid in Budapest until it was liberated by the Soviet Army in January of 1945. She later emigrated to Palestine and joined Hannah's brother, and together they kept Hannah's legend alive. 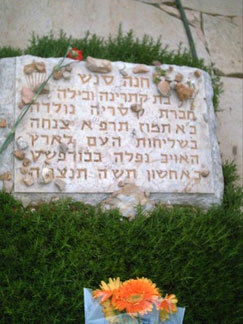 In 1950, Hannah Szenes' remains were brought to Israel and placed in the “Parachutists’ section” in the military cemetery on Mount Herzl in Jerusalem. 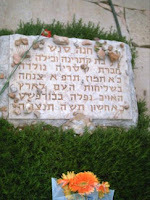 A village, Yad Hannah, honors her name today. Hannah Szenes' story touched me on so many levels. She had the moral courage and the mental strength to stand up against Evil. She was willing to sacrifice herself for her fellow man. She believed in making a difference, even if it cost her the most precious possession .... her own life. I fear that I may soon have to make similar decisions. I know I won't be asked to parachute behind enemy lines, and I don't have the fearlessness that comes with youth. I know how Evil the world can be. But when I'm asked to do my part, will I be willing to commit, even unto death? For me, Hannah is a symbol of inspiration and a role model that I could only hope to emulate. Philippians 1:20-21 " I eagerly expect and hope that I will in no way be ashamed, but will have sufficient courage so that now as always Christ will be exalted in my body, whether by life or by death. For to me, to live is Christ and to die is gain." Many years ago when I was in the 7th grade we watched films of the people being rescued from the concentration camps. It was gut wrenching to see these skin and bone people clinging to the wire fences all hope gone from their faces. There were piles of bodies waiting to be burnt. The word horror can't begin to describe what was done to the Jewish people. I remember Eisenhower saying be sure to record everything because history will try to say it never happened. I too believe the time is rapidly approaching when we as Christians will have to make courageous decisions. It is my sincerest desire to go before the Lord someday and have Him say "well done my good and faithful servant"
I don't think the haunting eyes of the concentration camp victims ever leaves us. I just can not see how one human being can do that to another. Evil is the only explanation. And I pray that I will have the courage and the commitment to stand up for my Lord and my fellow man, when the time comes to confront Evil. And I know I will only be able to do that through the strength that comes from Him.